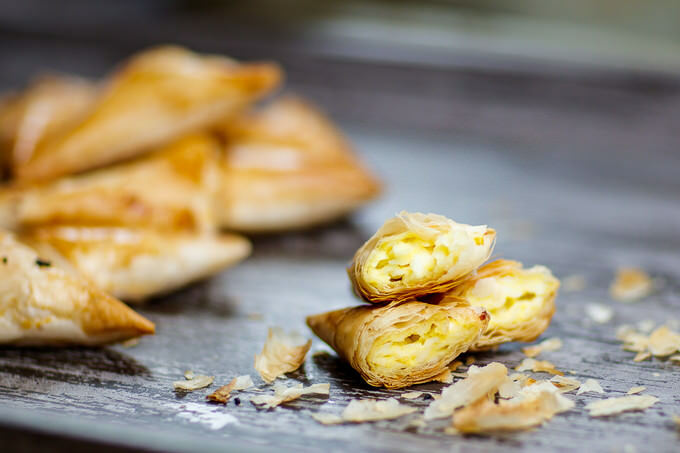 Flaky dough is created by store-bought fillo and this makes the baking process for the samosas a breeze. You can most certainly use homemade dough. But that recipe will come in a different post. 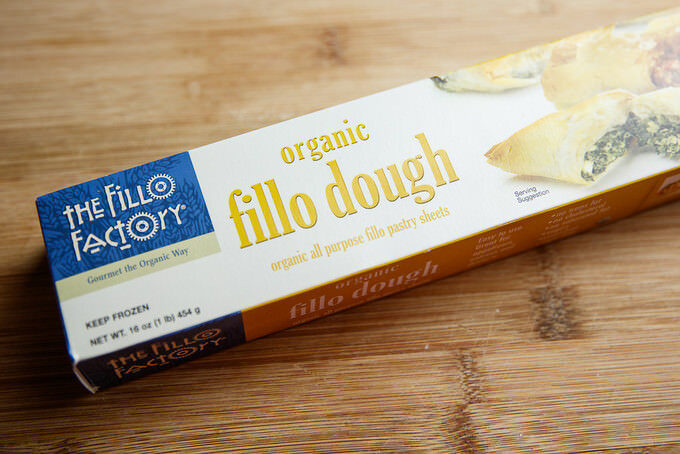 If you are using fillo dough, please follow the thawing instructions, which also explains how to keep the dough from drying out. 8 oz cheese of semi-hard cheese of your choice. Mozarella, Mexican Cheese blend, Sulguni, Monterey Jack will work fine. 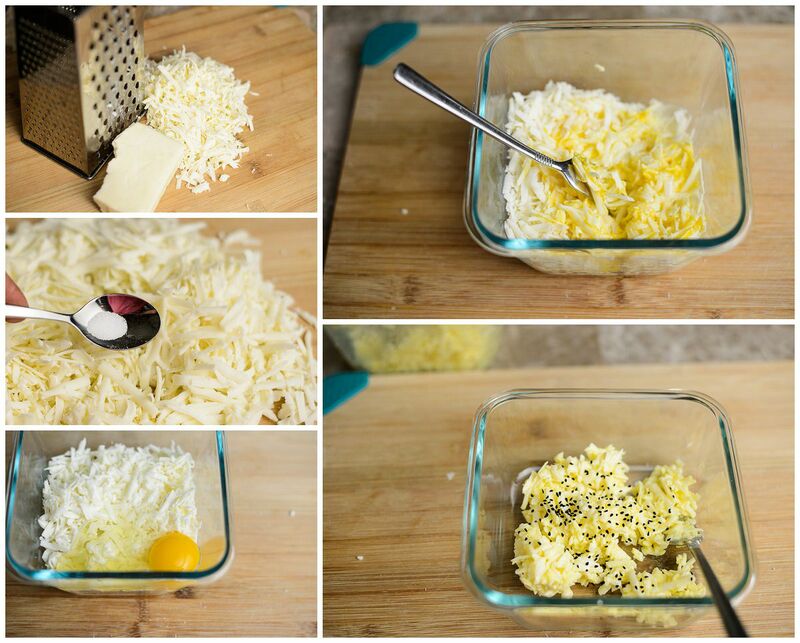 You can use pre-shredded cheese or you can shred your own cheese at home. Whichever works for you. If you are using low sodium cheese (like I was), I recommend adding a little salt to it for a balanced flavor. In a medium bowl mix cheese, 1 egg and nigella seeds, if you are using them. Cut out 3×10 (or 12) inch strips from the fillo dough. Put away unused fillo according to the package instructions. Fillo dough dries out very quickly, so, please cover the ones not being used immediately with a towel. Fillo dough is also very thin. Because of that will use two strips per one samosa. 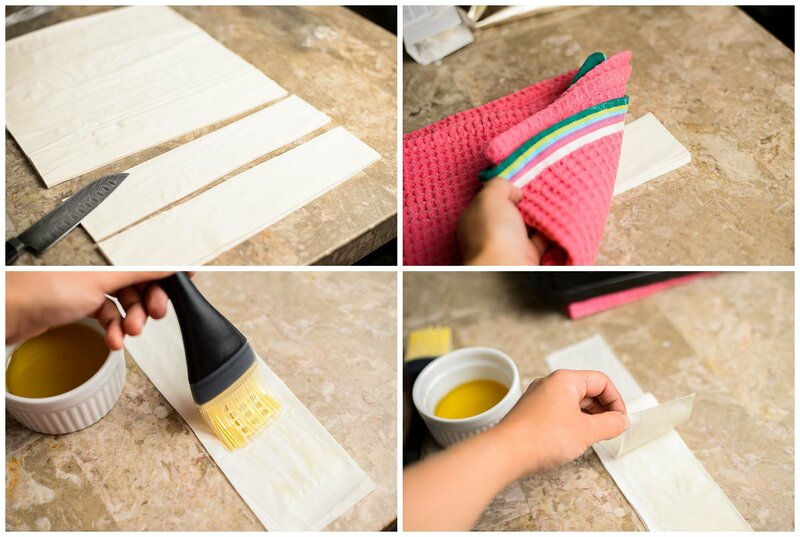 Take out two strips at a time and brush the layers with a little bit of butter. This will serve both as a glue and will give a great taste to your samosas. Place a 1/2 Tbsp of cheese mixture in the lower corner of the dough strip. These samosas are going to be triangular, you will need to fold them accordingly. 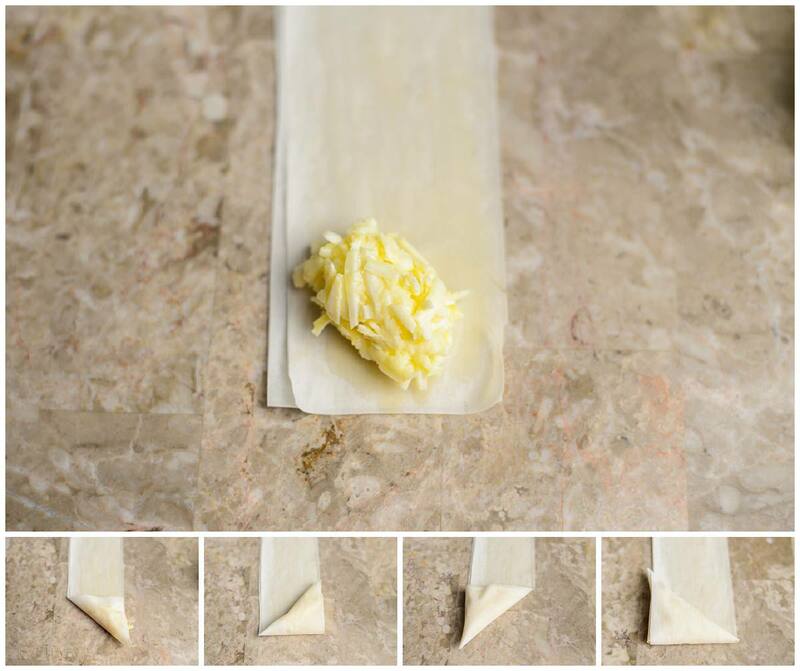 Fold the cheese side of the rectangle over the mixture to create a triangle. Fold the triangle up and repeat the process until you are done with the entire strip. 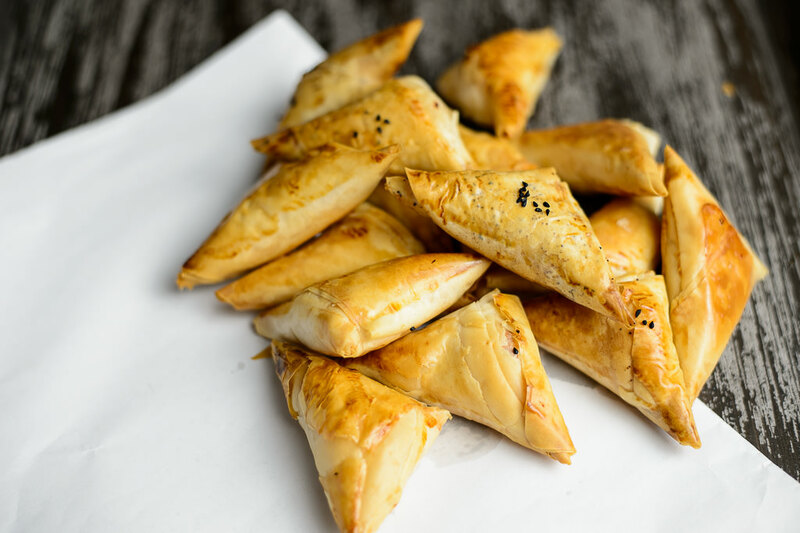 Place the samosas in a baking tray and brush each one with an egg wash. You can put some nigella seeds on top of the samosas, too. Bake samosas for about 40 minutes on 350F. Viola! Aren’t they very easy to make? Enjoy these little heaven bites. This is a super easy recipe for cheese samosa. I usually serve them with a jam for breakfast or make them as a compliment to soup entrees. Samosas are usually fried, but I like the baked option just as much, if not more. 8 oz cheese of semi-hard cheese of your choice. Mozarella Mexican Cheese blend, Sulguni, Monterey Jack will work fine. Looks delicious!! Is this a variation of the Uzbek samsa recipe? 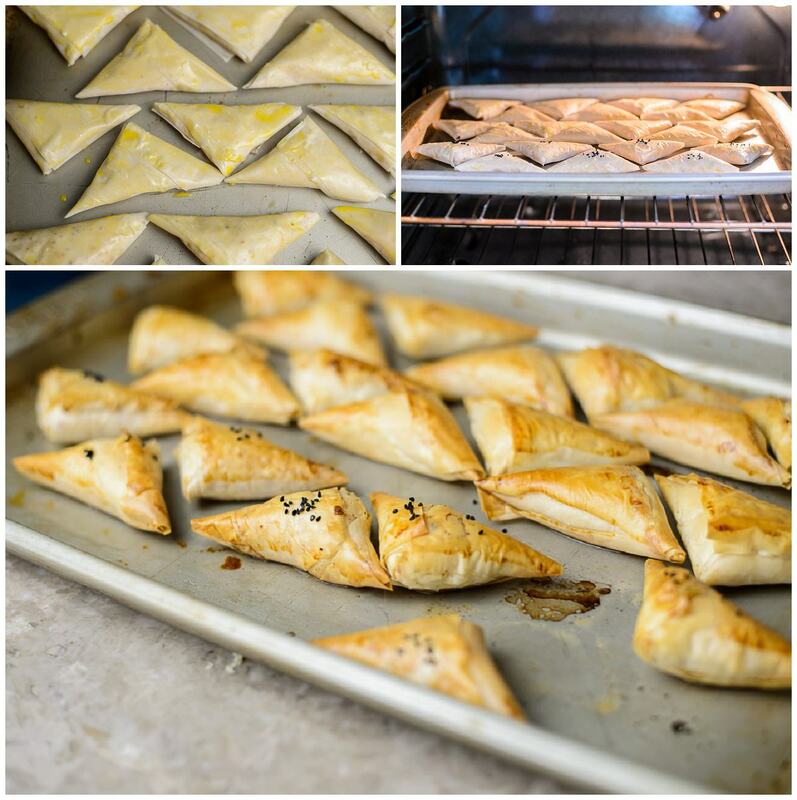 My apologies if that recipe is already on the site, but would love if you could feature traditional Uzbek samsa also. Thanks for all your content – this blog is great! Why do you add an egg ? Can it be made with out ? Hi Amy! Yes, can be done without eggs.